whenever we do online research for work, we encounter lotsa crap. lotsa fun crap, that is. sometimes that's why work takes so long because our brain welcomes fun crap—why write when we can waste the day away with mindless albeit entertaining drivel. 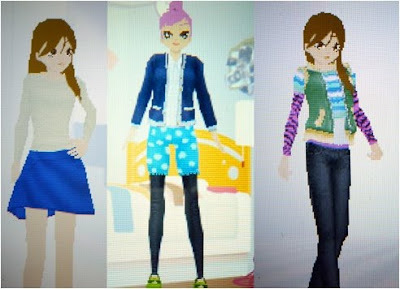 like look what we found this morning: something called style savvy, which is similar to looklet, only this one is cartoony and guess what, it scores you on your styling skills! it's an actual game by nintendo! but you can play for free on "the official site of style savvy by nintendo". try it! here's a review by nytimes.com's the moment. What’s more fun, working in fashion or pretending that you do with Style Savvy, a new video game that was released today? Tough call. For the past week, The Moment has been geeking out with a demo copy, and we’re somewhat embarrassed to admit the Nintendo DSi game is more fun than it has any right to be: you play a young, eager, fashion-forward girl trying to take the Horatio Alger route from retail sales assistant to world-famous stylist and entrepreneur. If all goes well at Strata, the store’s skinny-suit-wearing owner, Dominic, will ask you to open a boutique of your own. After that, we’re guessing, comes a pop-up shop, a Bravo series and an opportunity to work with Michelle Obama. Above, from left: Style Savvy looks channeling Phoebe Philo’s sporty separates look, Comme des Garçons’ spandex shorts, and Balenciaga’s bright striped accent pieces. My name is Shanay and I love the game Style Savvy. It is the best game ever.